Charming Beach-Block Duplex! - Sleeps up to 10. 3-Bedrooms on first floor, 2 bedrooms on second floor. Calendar is accurate for whole house rental only. For alternative rentals for smaller families, please see our other listings for this house: VR4804149 for up to six guests, and VR4808173 for up to four guests! Please call or email us for availability. Reserve your week for summer of 2018 now!! Tenant supplies own linens* and beach chairs, umbrellas, etc. Refundable Security Deposit of $1000 in addition to Rent. Tenant is expected to clean their unit before checking out. Linens can be supplied for additional charge of $150 per stay. 10 Beach chairs, 2 beach umbrellas, and 10 beach towels can be provided for an additional charge of $200 per stay. These fees are to be paid directly to owner. Check-in after 4pm, check-out before 11am. 1. The tenant affirms that he/she is an adult over the age of 25, and that the property will not be occupied by any minor(s) unless an adult is present. 2. Maximum number of persons, including children is limited to 10 . 3. The tenant shall not sublet the premises without written consent of the owner. 4. If any rent is unpaid, or if default shall be made in any of the terms and conditions of this lease, the premises must be vacated immediately with no refund due. 5. The tenant shall be responsible for any loss or damage to any personal property of the owner during the term of this lease. Tenant shall leave the property in a clean and orderly condition, ready for next tenant. 6. In the event that the property is damaged by fire and is unusable, the unused portion of the rent shall be returned. One-half of the unused portion of rent shall be refunded in the event that any Act of God renders the property uninhabitable before or during the tenancy. 7. Tenant shall furnish linens, blankets, and such other items the tenant desires. Landlord supplies mattress pads, pillows and bedspreads. Sheets and towels may be provided upon request, at an additional charge of $150.00. 8. Tenant shall keep no pets of any kind on premises without consent of landlord. 9. Absolutely no “house parties”. Should a “house party” occur in the rental unit, occupancy will be terminated with no refund. 10. In the event the Tenant wishes to cancel this lease, he/she shall make such request in writing to the owner. This agreement shall be terminated only after another Tenant is secured or permission from the owner is otherwise granted. 11. Security deposit: Additional sum of $1000.00, payable with rent, to be returned upon satisfactory inspection by the owner after termination of lease. Owner shall have 10 business days after expiration of this lease to return deposit or advise tenant of any damages. 12. Any appliances and/or television sets for tenants' use are represented by owner to be in working order, but theirperformance is not guaranteed by owner during tenancy. Nonetheless, owner shall make every reasonable effort to have necessary repairs/replacements made quickly and efficiently. 13. SIGHT UNSEEN RENTALS: We highly recommend that anyone signing a lease, personally inspect the property beforehand. The owner makes no warranty. 14. No air conditioning shall be installed without written consent of the owner. 15. Ten (10) beach badges are provided for tenant's use during term of lease and must be returned to owner for the use of the next tenant. 16. Only basic cable tv service is included in this rental. Tenant is not permitted the use of pay-per-view or other premium cable amenities. If prior to moving out you do not clean the item(s) listed below and leave them in satisfactory working order, the following charges will be deducted from your security deposit or owed to us if your security deposit is insufficient to cover the charges. You will be charged the listed amount for each instance in which a listed item must be cleaned or repaired. The prices given for the items listed below are average prices only. If the owner incurs a higher cost for cleaning or repairing an item, you will be responsible for paying the higher cost. Please note that this is not an all-inclusive list; you can be charged for cleaning or repairing items that are not on this list. Replacement Charges: If any items are missing or damages to the point that they must be replaced when you move out, you will be charged for the current cost of the item, plus labor and service charges. A representative list of replacement charges is provided below. These are average prices. If Owner incurs a higher cost for replacing an item, you will be responsible for paying the higher cost. Please note that this is not an all-inclusive list. You can be charged for the replacement of items that are not on the list. 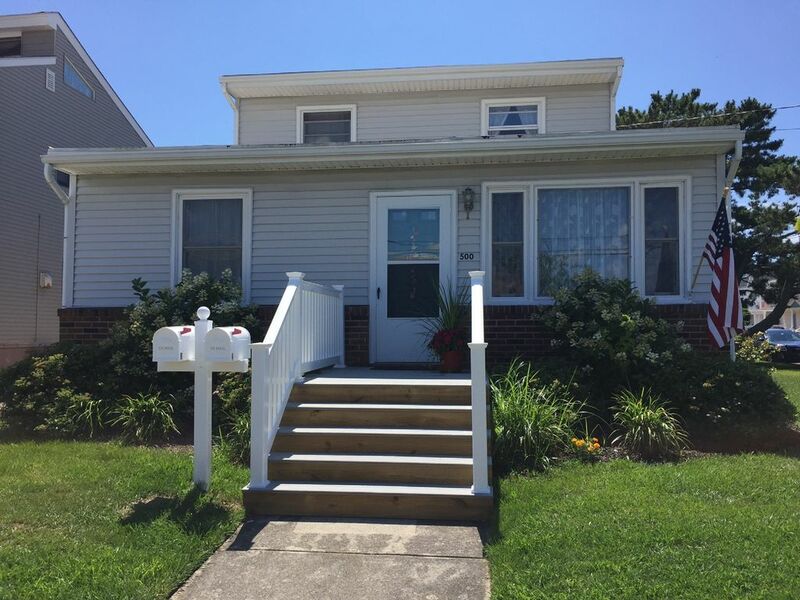 About Us We have owned our vacation home in Brigantine since 1992. We have established a fine reputation for ourselves for honesty and reliability, and have many repeat visitors each year. We maintain our property in excellent repair, with personal care and attention to comfort and cleanliness. We have been told by many guests that we have the nicest value going for a shore rental. We do not use real estate agencies to list our rentals. We prefer a more personalized approach. We want our visitors to feel personally welcomed, while avoiding the rental fees and commissions charged by realtors. And we appreciate the kindness and consideration we get in return. As a testimony to our value, we are honored that many people return to stay our place year after year. About Our Rentals Our duplex is a converted cape cod style home which was built in the 1940's. It has a wonderful nostalgic charm, yet it has been updated to offer our guests most of today's modern amenities. We are located on the north end of Brigantine (the quieter, uncongested end of the island) and are exactly one block from the beach. Our beach is a swimmers' beach and we usually have a lifeguard stand at the end of our block. We are situated on a corner property and we have large grassy yard, as well as plenty of on-street parking. Lovely, home-like property 1 block from the beach. Our family rented both the top and the bottom apartments for 2 weeks. The house was pretty, comfortable and very clean. Just about everything we could need was there. Liz provides a gas grill and a picnic table in addition to the indoor facilities. The yard in back was large enough to set up a croquet game.The beach there at 5th St had a lifeguard and, except for the weekend of the 4th, the beach was never crowded. Even then it wasn't bad. The neighborhood is residential and very pleasant to walk or bike thru. A playground for my granddaughters was 1 block away. A Nature preserve was an easy bike ride away so my naturalist husband could watch birds and other wildlife to his heart's content. Grocery stores and restaurants are nearby. One of our best family vacations! I hope we can arrange to come back. Thank you so much for your thoughtful review! Unlike all the new 'cookie-cutter' monstrosities being built in Brigantine, our beach house is older and on the 'nostalgic' side. We've always tried to maintain that cottage-like charm. We do our best to have all of our guests feel welcome and comfortable. We take great pride in keeping our home as spotless as possible, and we're happy that you noticed! So glad you enjoyed the yard and nearby environs! I've been told that a beach replenishment is scheduled for October 2017, so you will be amazed at the beach next summer! Hope to see you then! We loved this place! We stayed on the 1st fl and had plenty of room for 4 adults and a 6 yr old. The walk to the beach was closer than we anticipated and the beach was amazing; very clean and not crowded. The house was well stocked. This rental includes beach tags, which they check for everyday. The yard was the perfect place to gather after the beach and have some more family time. FYI Take bug repellant. They mosquitos are vicious at night! I was a little concerned that there wasn't central air, but the air conditioner was perfect. We weren't hot at all. There was a grocery store close by. We didn't want for anything. Liz, the owner, was very nice and more than helpful. She even took the time to print scenic directions for us. The security deposit was returned within a reasonable time. We would definitely stay here again. Thanks, Liz! You made it easy for us! My husband and I took a last minute vacation the week of June 14, 2014. I found this rental property, notified the owner and was fortunate enough to have this week open for us to stay in the upstairs apartment. I was very apprehensive about staying here as it was not oceanfront and I had never vacationed where I did not stay oceanfront. With such a deal on a vacation rental, we decided to take a chance and rent it. The owner was AMAZING. We had never rented a unit with such a personal touch. Liz thought of everything, making this one of the best vacations ever! Brigantine beach is beautiful and the apartment was only a 1 minute walk to the beach. We actually preferred the privacy of being off the beach, yet the ability to enjoy every bit of a beach vacation! We found the walk to the house shorter than some beachfront units and did not have to drag food as we could walk to the house for lunches and anything else. From the deck you could actually see the ocean and hear the waves. Thank you Liz for your hospitality. I would highly recommend staying here and with the money you save, take a rainy day (5 minute) drive to Atlantic City and enjoy the casino or go shopping at the outlet stores! While in Brigantine stop at the Seaside market, a short walk or 2 minute drive and get fresh bread and delicious side salads made fresh daily. They are a full grocery store in case you need anything. The apartment was located not only (in our opinion) the best stretch of beach, but convenient to shopping if needed. Thank you Liz for taking such good care of us, we look forward to coming back! -Lifeguard-protected beach on our block during peak weeks! -Nice corner yard with plenty of curbside parking. -Quiet and less crowded north end of the island, and only 10 minutes from Atlantic City's casino and boardwalk action. -The best of both worlds! You won't believe what a great deal this is for this property! In the interest of full disclosure, we do not have CENTRAL air. We have a window unit (5,000 btu) on the second floor and a large unit (25,000 btu) on the first floor. Both will keep each floor comfortably cool. We also have plenty of fans and the sea breezes in Brigantine are almost always sufficient for most people. Please note that rates shown do not include the refundable deposit of $1000, which is paid in advance. Refund is issued within one week of your departure, provided that you have cleaned the house, left beach tags for next guests, keys in lock boxes, and there are no damages to my property.